Not retail innovation – clearly our space is innovating and “being innovated” daily, often through vertical application of emerging cross-industry technology. But retailer innovation? Have in-house transformation efforts stalled? If so, what do we do about it? 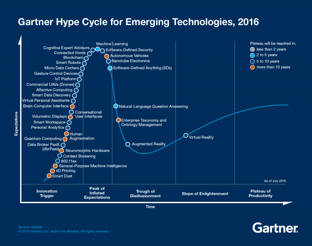 The most interesting points come from that question -- and, hint, it might involve outsourcing or test-sourcing. Up front, let’s admit Amazon is the exception that proves the rule. Go stores. Alexa integrations. Drones. Floating balloon DCs. All in-house. That said, the headlines suggest in-house innovation is struggling. Target killed two high-profile projects: store of the future (aimed at Go), and an “entrepreneurs-in-residence” program code-named, “Goldfish.” In CPG, Coca-Cola shuttered their Founders start-up after three years, citing challenges with start-up/corporate cooperation – the problem is not with either party (several start-ups received non-Coca Cola funding), but how they cooperate to drive benefit inside Coca-Cola. Happily, “inside-out” isn’t the only option for innovation. Retailers have been notoriously reluctant to do two things: to view vendors as strategic partners; and to give third-parties control over the consumer interface. This is changing, in part because consumers pick their own interface (Alexa, Google, Instacart, whatever) and because retailers realize these UX players move at consumer speed. Google made their NRF debut, making the “north end” of the hall hipper than usual. With good reason – their VR API is being used by Wayfair and Ivyrevel to give shoppers an immersive experience (with furniture and clothing, respectively) and via a “closed beta.” Like the Ivyrevel teaser says, “Created with our friends at Google.” This is smart. The Wayfair example also suggests purely internal innovation isn’t dead, just outdated. While partnering with Google, Wayfair launched the “Wayfair Next” internal R&D team. They’re innovating how they innovate. Innovation – and the last-mile – also spill into foodservice. McDonald's – not happy with Big Mac ATMs alone – has partnered with UberEATS to deliver in southern and central Florida (read: Miami and Disney). McDonald's gets a capability it is unlikely to develop in-house, while UberEATS gets additional utilization and monetization opportunities for drivers. A last point on “test-sourcing”: Since many startups are composites of underlying services or platforms, retailers often implicitly test more than one innovation. AI-based contact services test their failsafe mechanisms. Arise clients leveraging crowd-sourced care capability benefit from the supporting tools we developed. Those are just two near-and-dear examples. Every retailer test-sourcing innovation should understand the full bundle they’re getting. It’s often richer than they realize. Consider the FedEx-Walgreens partnership. FedEx gets convenient, multi-parcel drops at accessible locations; Walgreens gets additional footfall and asset utilization. Alt-fulfillment happens to be one of the hottest trends in last-mile innovations – and the least profitable when tackled alone. During December’s Arise-EKN webinar, “buy online, deliver using third-party service” ranked second least-profitable (with 29% calling it “significantly unprofitable); “buy online, pick-up in locker” fared worst. The FedEx-Walgreens partnership gives both an advantage and cuts against the negatives of a go-it-alone strategy. Retailer-consortia have sought to disrupt entire spaces while sharing risk, with mixed results (for example, MCX, primarily associated with Walmart but much broader, took on Visa and is unwinding). Smaller consortia like Plug and Play are more nimble, providing startups with access to platforms and a select group of retailers and brands. One Plug and Play claim to fame: Hiku, which helped French retailer Auchan launch in-home scanning (link in French) and Dash-like one-touch shopping before Amazon. Oddly, you can buy it on Amazon! Another consortia trend: non-retailers. The Canadian Retail Innovation Challenge was launched by Oxford Property Group (a real estate developer), the Retail Council of Canada (a trade group), Dx3 Canada (a trade show), and Retail Prophet (consulting arm of one-man retail army Doug Stephens). After a pitch contest and selection, winners will test their product or innovation at an Oxford property. Days after closing SoF and Goldfish, Target launched “Target Takeoff” and pivoted to health- and wellness-related startups. Target isn’t abandoning innovation, but seeking a new line of attack in external, early-stage companies. Rebecca Minkoff announced an even larger step, launching a fashion-focused VC fund (partnering with Quotidian Ventures). The focus on startups is not new, but the pace and intensity are increasing. 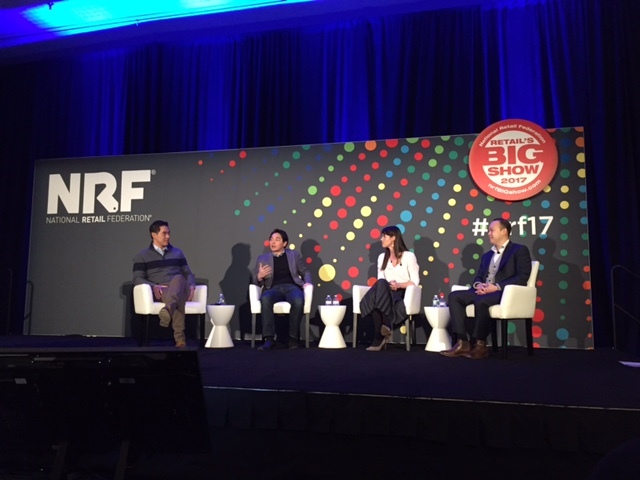 NRF ‘17’s saw startups taking the stage – and VC / PE investors prowled, even braving the basement floor. Walmart (full disclosure – a former client) rules here. Jet.com was a genius purchase because it’s not about out-Amazoning Amazon but about leveraging Walmart’s massive physical advantage. Instead of banking on their ability to “build” or “bring-up” innovation, Walmart banked on their ability to “buy” then integrate. It might be wrong, but it’s not crazy. I love the Moosejaw buy, too, for similar reasons. It’s not the revenue stream, it’s that Moosejaw knows how to foster cross-channel brand activation – and they have a unified commerce platform to support it. Let’s also admit that quiet innovators often get overlooked. Kroger hosts multiple in-house teams of R&D and digital innovation. They win awards. They crush quarterly comps. But, hey, hovering DCs! Same for those who realize changing the approach to innovation can be positive. Kohls CIO-CTO Ratnakar Lavu spoke at NRF about abandoning “four year projects to transform the store” in favor of a “slow roll” approach of continuous transformation. Prior to joining Arise, Tadd directed business consulting for Toshiba Global Commerce Solutions, and served as partner for the world’s largest store-based retailer.